← How can you look this bad and still call yourself French? 11 Responses to Random Panel: Plus cancer! 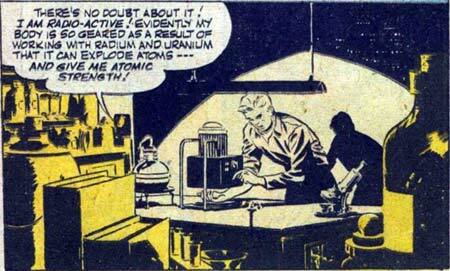 …and just what the hell is “atomic strength,” anyway? Sweet fancy Moses! A talking beaker! @Hugh: LOL! “Beaky” (…as he shall be known forthwith) was granted both sentience and atomic strength after the initial radioactive experiments, and believe me, he is gonna to need that atomic strength. After Prof. Butter Q. Fingers finishes zapping his own arm with high-grade plutonium, he’s going to have alot more accidents around the lab and Beaky needs that nigh indestructible shell with all the constant droppings he’s facing. This scene actually makes more sense if it is the beaker talking. God bless you Beaky, my you become the heromachine mascot. BEAKY’S BEEN KIDNAPPED BY THE VENUSIAN BIRD WOMAN! It’s a shame that they killed the title after Beaky’s teen sidekick raised too many eyebrows. I am looking forward to Frank Miller’s bold reimagining of the franchise this winter, however.